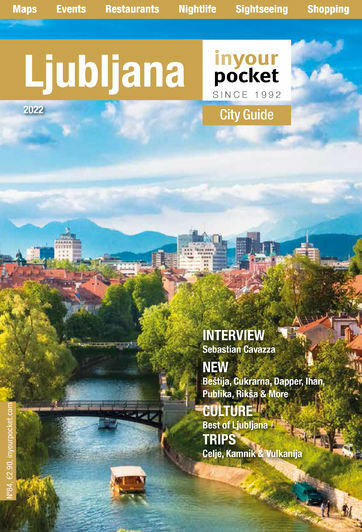 Perched on top of Castle Hill (Grajska planota) and dominating the city skyline to the south, Ljubljana’s magnificent castle stands on the site of several former defensive buildings in a hilly area of land stretching away to the south of the Old Town. The castle in its current form was built by Emperor Frederick III of the Habsburgs in the second half of the 15th century. The fortress was used to consolidate Frederik’s influence in the area and to defend against increasing incursions of the Ottoman Army. 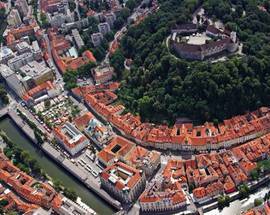 Not unlike Kraków's Wawel Castle in Poland, Ljubljana Castle has served as both a royal residence and a military barracks over the centuries. 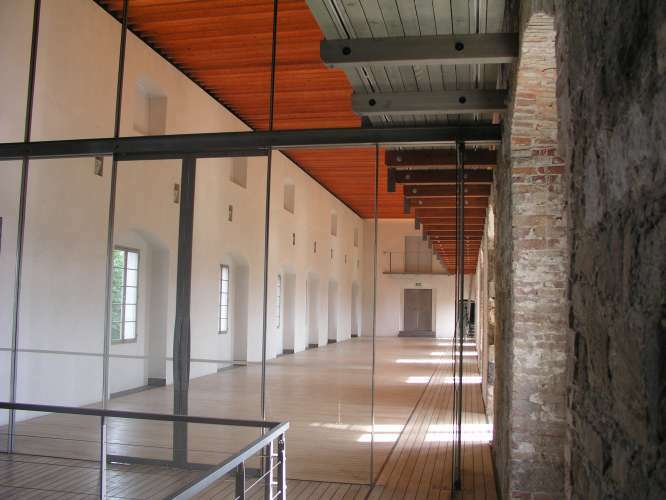 The current main points of interest for the visitor are the Viewing Tower (Razgledni Stolp), built in the 19th century and raised a further 1.2m by the government in 1982. The tower’s Virtual Castle screens a 12-minute film translated into more than 10 languages showing an interesting and informative history of the castle. On the same floor find a small door that takes you to the top of the tower up some 100 red cast-iron steps, each individually decorated with an image of the tower and the city’s dragon. A door at the top leads to a small viewing platform (not for the faint hearted) with wonderful views of the city. Underneath the tower and located down a small flight of stairs tucked away through a doorway in the corner of the courtyard is the diminutive St. George’s Chapel (Kapela sv Jurija), one of the oldest parts of the castle. By the order of Cesar's document from 1489 it was dedicated to St. George, the patron saint of Ljubljana and was renovated in the Baroque style and in 1747 decorated with the coats of arms of over 60 rulers, including Herman and Ulrich of Celje, Henrik of Gorizia County, and Krištof Rauber, a former bishop of Ljubljana. 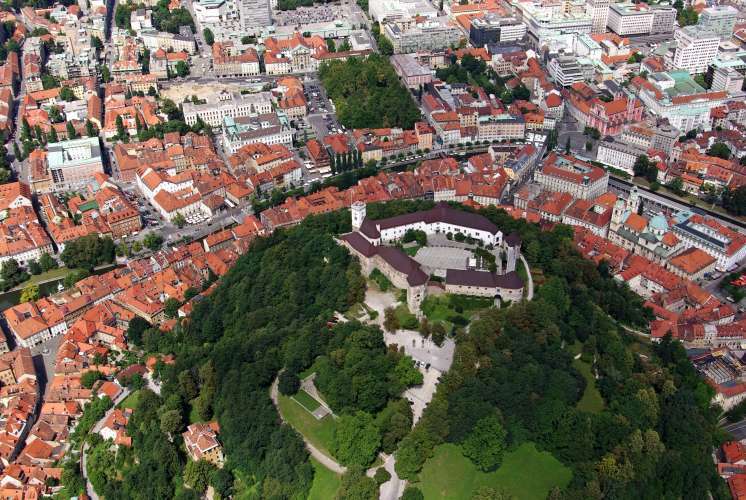 The Castle also has a beautifully presented permanent Exhibition on Slovene History and visitors of all ages will enjoy a trip to the Museum of Puppetry housed above the Castle’s Estate Hall. 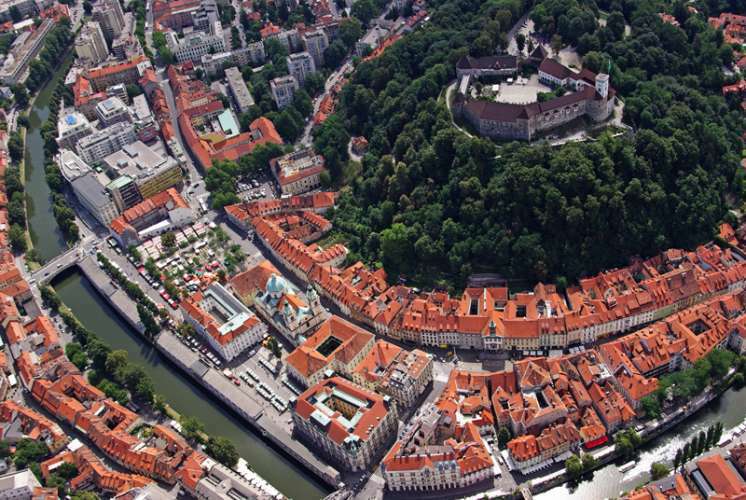 The castle also offer a range of tours such as guided viewings of the Castle and exhibitions by knowledgeable locals and the unique Time machine and Behind Bars immersive tours or else take in Ljubljana’s premier attraction at your own pace with commentary courtesy of an audio guide available in 14 languages. You can even save a dragon in a fun adventure game Escape Castle. 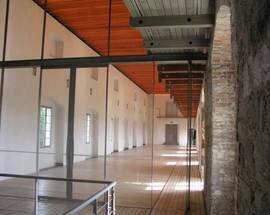 There are also small art galleries featuring temporary exhibitions as well as a café, restaurants and castle souvenir shop. It’s also a popular place for local weddings, and during the summer puts on concerts and, in July, hosts a popular outdoor cinema. To reach it, several small paths lead up from the Old Town, or take the funicular from next to the Puppet Theatre on Krekov trg. Jan, Feb, Mar, Nov 10:00 - 20:00, Apr, May, Oct 09:00 - 21:00, June - Sept 09:00 - 23:00, Dec 10:00 - 22:00. Selected parts of the Castle are free to access. 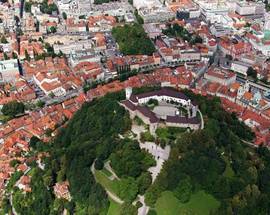 Castle ticket (gives access to Outlook Tower, Virtual Castle, Puppetry Museum and Slovenian history exhibition) With funicular/without funicular - adults €10/7,5, students/children/seniors/groups €7/5,20, families €26/19. Funicular return/one way - adults €4/2.20, students/children/seniors/groups €3/1.50, families €10/6.